Here is a status report on how Dominions 3 is doing on greenlight. 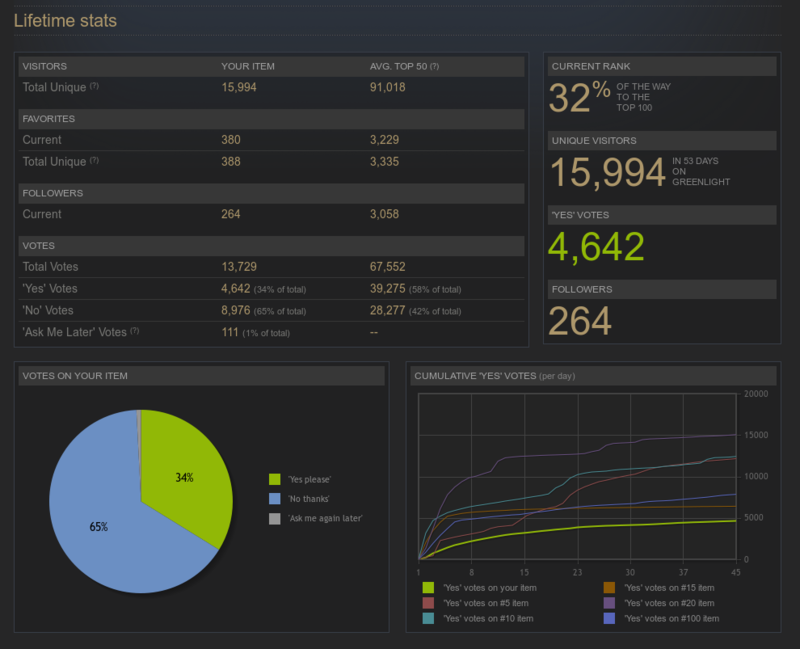 I'm not sure myself, but the information that valve gives to the developers says it's 32% on the way to top 100. Below is a screenshot of the developer's info page. Dominions gets a lot of no votes, but I guess that is to be expected for a deep strategy game considering that the question is 'would you buy this game?'. A more casual game would probably do a lot better with random visitors. So how many votes do you need? Here is a chart with greenlight games that I found. It looks like you need about 1000 comments to be greenlight material, or maybe a bit fewer as some of those come from after being greenlit. Number of favorites seems very random for the games that made it through. Thanks for the 264 comments that Dominions 3 has got, but it looks like we need many more to make it through.